Reliance Jio, the new 4G operator led by Mukesh Ambani, is coming under increasing criticism for slow connection speeds, but our latest test reveals that it is possible increase the speed by making a minor change to the access settings of client devices such as smartphones. Broadly, the issue seems to be that Jio’s IPv4 (or traditional) routing infrastructure is under stress, which is preventing users from experiencing the full bandwidth that is available to them. On the other hand, unlike other telecom networks, Jio also has an alternative routing mechanism built on the modern IPv6 protocol. However, due to an error in the way client devices (smartphones) are configured, this routing infrastructure is being underutilized. Download and upload speeds can be increased by configuring your device to use the newer platform — which is handled by an entirely different team of routers that are not under pressure right now. As of now, nearly all smartphones on the network are currently tuned to use only IPv4, which is the reason why the v4 routing infrastructure is under stress. These settings (found in APNs) are often set by the network, but can be edited by the user. As of now, only the only devices that are auto-configured to connect using IPv6 are the JioFi dongles. In case of JioFi, when any website or app supports IPv6, it immediately switches the traffic to the new version. Otherwise, it uses the old IPv4 connection. If all smartphones do the same, then the speed of Reliance Jio’s 4G service is likely to see a massive improvement. 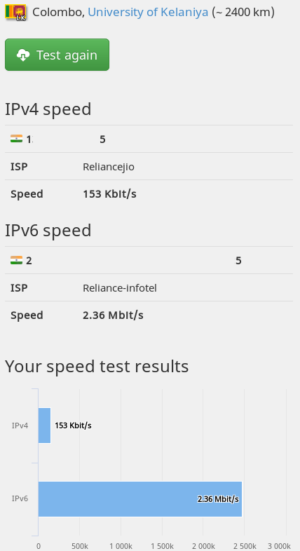 Our tests indicate that at present IPv6 connections on Jio’s network feels 5 to 20 times as fast as the older variant. 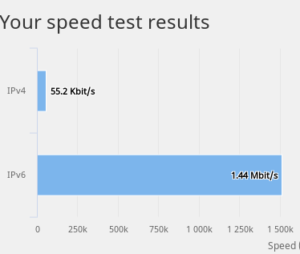 The tests were carried out using the speedtest facility offered by ipv6-test.com The facility tests bandwidth over both the traditional format as well as the new format (see chart on top). We were able to see a consistent and tremendous difference in bandwidth between the two protocols. It is possible to try this at home using your own smartphones as well. To do so, the user simply has to go to his APN settings (found inside ‘Mobile Networks’ settings) and switch the ‘APN Protocol’ of jionet to IPv4/IPv6 from IPv4. This will ensure that both connections are established by the smartphone when it connects to the Internet using the jionet APN. Of course, it is also possible to select just IPv6, but doing so will prevent you from accessing many servers that only support the legacy version and not the latest technology. Many app servers, and some websites, do not work on the new protocol. TIP 1 – Use this Chrome extension to check what kind of connection has been made to a particular website. TIP 2 – Much of Jio’s routing infrastructure can be bypassed by using Chrome’s data saver extension, which converts all websites from version 4 to version 6 automatically and also switches the traffic to Google’s own fiber network and routing system in India after the initial leg. This increases responsiveness when browsing. On the downside, the extension also takes your traffic halfway around the world where processes the data and ‘releases’ it onto the world wide web. This feature can be enabled in mobile Chrome browser by ticking the ‘data saver’ option in Chrome settings. Similar services from Opera do not boost speeds as they do not support IPv6 either on the mobile or desktop. TIP 3 – Most of the ‘speedtest’ servers in India are overwhelmed by traffic, and do not show the real bandwidth at the users’ end. Use alternative locations such as this one in Netherlands to find out the real speed. Internet Protocol version 6 is the most recent version of the Internet Protocol, the communications protocol or framework that is used to identify and route traffic to each computer or device connected to the Internet. Without Internet Protocol or IP, the data that we ‘send’ from one computer or device will not ‘know’ how to reach its intended destination. It will be a bit like an FM or TV transmission, where signals can be received by anyone in the transmission area. On the Internet, however, most data cannot be received by just about anyone, but only by a specific computer or device for which it is intended. Data signals are bounced off from one ‘router’ to another till it reaches the intended recipient, even if he or she is on the other side of the world. This addressing system was at version 4, and comprised of four numbers of up to three digits each for each computer, such as 172.217.1.78 (which stands for google.com) and so on. However, with the rapid growth of the Internet after commercialization in the 1990s, it became evident that far more addresses would be needed to connect devices than the IPv4 address space had available. By 1998, the Internet Engineering Task Force (IETF) had formalized the successor protocol. The total number of possible IPv6 addresses is more than 7.9×1028 times as many as IPv4, which uses 32-bit addresses and provides approximately 4.3 billion addresses. The two protocols are not designed to be interoperable, complicating the transition to IPv6. However, several IPv6 transition mechanisms have been devised to permit communication between IPv4 and IPv6 hosts. IPv6 addresses are represented as eight groups of four hexadecimal digits with the groups being separated by colons, for example 2001:0db8:0000:0042:0000:8a2e:0370:7334. This raises the question of why there is such a marked difference between speeds using both protocols on Reliance Jio’s network. Technically, the edge that the new protocol gains over the older one is very small, and should not create such a huge disparity between the observed speeds of both. However, the newer protocol is considered simpler and more efficient for routing, and in case of a network that is undergoing stress, this may make a huge difference. This is especially the case where data chunks (called packets) are sliced into even smaller ones by routers in case of congestion. In the older technology, this function is carried out by the router, while in the latest version, this is not. In addition, it is most likely that the IPv4 routers on Jio’s network are facing the brunt of increased usage, while IPv6 routers are relatively underutilized. As a result, IPv6 traffic is automatically routed much faster than IPv4, even though both have the same ‘bandwidth’ or speed at their disposal. This gives the user the feeling that the IPv6 website loads much faster.